Nurses are on the move and they aren't carrying around medical books and a computer to help them when they need it. Wait, on second thought, that little smart phone in your pocket is just that, a computer, filled with apps catered to your needs. If you need definitions to medical terms, there's an app for that. There's also one that will keep you up to date on medical news and others that will provide you with information on specific diseases and medical cases. If you haven't looked into apps that can help you out in the Nursing field, here's a list of the best of the best. Unbound Medicine’s award-winning Nursing Central app is available on Android and iOS devices. Users are satisfied with its extensive drug and disease information. Nurses and students are able to work more efficiently thanks to Nursing Central providing detailed information on diseases, tests, drugs and procedures on the go. A free Android and iOS app, Diseases Dictionary offers a long list of illnesses and conditions nurses are apt to encounter, along with symptoms and preferred treatments. Nurses and students can type in the symptom and a list of possible diseases will appear; this app provides comprehensive information about how to deal with symptoms/how to prevent the disease; and how to improve knowledge about diseases. For over a century, medical professionals have relied on Black’s Medical Dictionary. With over 5,000 definitions of medical terms, this app features a navigational display with rich media experience; user-friendly, intuitive interaction; and the ability to share with friends using social media features. Reviews are mixed, with some users complaining of the app’s $14.99 price tag. 2,000 full-color photographs will help you visually diagnose common and uncommon conditions and diseases encountered in clinical practice. At $124.99, it’s not ideal for nurses on a budget — but satisfied users report that the app’s thorough explanations and color pictures are well worth the money. The oldest continuously published textbook for English-speaking medical professionals, the Merck Manual is free on iTunes. This app includes “How to Do” videos on numerous outpatient procedures and physical examinations; quizzes that check knowledge of medical disorders, symptoms and treatments; interactive case simulations that test the ability to treat a specific patient over the disease course; and editorials written by top medical experts. Some users believe it is a must-have for nurses, but others feel it’s difficult to navigate. Get up to date with the latest developments in the medical world with MedPage Today, MedPage is the leading source for breaking medical news, daily coverage of over 30 specialties, annual coverage of over 60 meetings and symposia and free CME and continuing education credits. Satisfied users on iTunes claim that Pedi STAT is the easiest medical app to use. Described as a rapid reference for RNs, paramedics, physicians and other healthcare professionals caring for pediatric patients in the emergency or critical care environment. The Google Play version costs $7.87. The NurseTabs series offers a thorough overview of several important topics, with many concepts discussed in video form. App users will have access to over 120 skills and procedures separated by topic areas learned through fundamental nursing courses. After selecting a skill, you’re presented with the equipment needed to perform the procedure and a step-by-step of how to perform it safely. The app is $9.99, but in-app videos cost another $4.00 — a fact that does not please some users. Another valuable app in the NurseTabs series, MedSurg focuses on diseases and conditions. This app is suited for novice nurses and nursing students with over 340 common diseases and disorders that are separated by the body system. Once a disease/disorder is selected, nursing processes, managing client care and tons of other useful information is at your fingertips. Like Fundamentals, it costs $9.99. The two apps are available in bundle form for $19.99 on Google Play. The Nurse’s Pocket Guide is constantly updated with new information on diagnosis and interventions. Each diagnosis listing includes a definition, related factors, defining characteristics, prioritized actions/interventions, NIC/NOC classifications and documentation of guidelines. The free app is available on iTunes and Google Play. An HIPAA-compliant app, Voalte One provides exceptional communication for caregivers. It provides alarm and nurse alert notifications, text messaging on easy-to-use app. It also offers VoIP calling. This tool helps streamline communications in tough situations. It’s easy to use and provides a way to gather information immediately. Earning continuing education credits can be a challenge, but NursingCenter CEConnection makes it easy. Thanks to this easily accessible app, you can view CE courses and complete them offline whether you’re at home, on your commute or on your shift. Once you return to a wifi connection, your assignments will automatically sync with your CE Planner account and access your certificate. Download Heather’s Nursing Cheat Sheets on your Android device and get ready to access the detailed information you need, when you need it. The app has a temperature conversion chart, a neurological coma scale, and several other helpful cheat sheets. It is important to know that the information in this app is compiled from a variety of sources and you should always know your own facility’s protocols. With information on over 5,000 generic and brand name drugs, Davis’ Drug Guide is a great and comprehensive tool. With practical information on trade name and generic drugs, each focuses on safety and patient care, including information on dosing and administration, interactions, side effects and patient teaching. The app has numerous rave reviews on Google Play. Available on iTunes and Google Play, Epocrates Rx boasts high ratings on both platforms, and 1 out of every 2 physicians rely on Epocrates to enable better patient care. The app offers detailed information for a wide range of brand, generic, and over-the-counter medications. A one year Epocrates Plus subscription is available for $174.99. 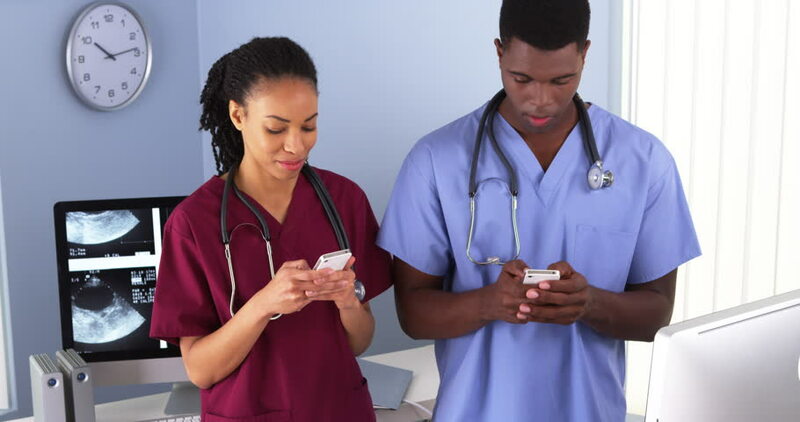 Published by McGraw-Hill, this useful Android app helps nurses successfully carry out one of the profession’s trickiest tasks. It features several helpful learning tools, including a ‘Favorites,’ ‘Recent’ and ‘Word of the day’ features to help you further enhance your vocabulary from an extensive library. The Google Play version is free, but offers in-app purchases. Whether you’re currently in nursing school or could use a refresher, the NCLEX Flashcards app has over 1,600 practice questions, quizzes, mnemonics, and strategies. Bonus: If you purchase the mobile version, you’ll be granted access to the full-featured online version. The Google Play version is free, but offers in-app purchases. Quantum X. Inc’s Nursing Guide App offers a range of information for nursing students and experienced nurses alike. Equipped with mnemonics, articles and tips and quotes, this app was created to share basic to complex information about the nursing field. The Critical Care ACLS Guide is the smartphone age’s response to a classic, twenty-year-old booklet that made it easier for nurses to check doses and interpret EKGs. You can have immediate access to critical information loaded with rich content, detailed illustrations and features including quick navigation, expanded search capability, calculators and custom bookmarks. Scheduling can be a hassle for nurses, but with iTunes’ NurseGrid, it doesn’t have to be. Used by over 200,000 nurses, the app allows for schedule management across several work sites. Because of this app’s user-friendly features, it only takes a few seconds to create your shift calendar for the next few months. You also have the opportunity to connect with other NurseGrid users who work in your department. Nursing Procedures focuses largely on providing nurses the best resources before they begin a procedure. Ranging from assessments to medication administration to code blue situations. As a bonus, you’ll get a Weekly Funny once a week that gives you a funny video, quote, picture or meme to cheer you up. The iTunes version is free. The Nurses First app features daily nursing tips, fun facts, nurse quote section, Vines section and a giveaway section. Information is pulled from the top nurse blogs and fan sites; everything you need to know in one mobile app. Most features of the IV Drip Rate Calculator app are available on modern pumps, but modern pumps aren’t always available. With this app you can add a drug amount in mg, mcg, grams or units to a volume of fluid, select the dose ordered and the ml/house necessary to deliver that dose will display. Several satisfied users claim that the app has made their jobs easier. This simple and straightforward iOS and Android app work whether you are using gravity or pumps. It will give you your answer in mL/hr, gtts/min and gtts/15 seconds. This app also includes an IV Push calculator and a Fluid Rate calculator. The Pro upgrade to the app costs $0.99. Amp up your nursing skills with Nursing Reference Center. The app provides relevant clinical resources to nurses, directly at point-of-care and offers the best available and most recent clinical evidence from thousands of full-text documents. Note: to use the NRC app, you must obtain an access key. Quick answers for pressing medical questions are available on the iOS Lippincott Nursing Advisor app. Although many facilities offer free use of the app, some users must make in-app purchases. You’ll have access to regularly updated clinical content by a team of nurses and clinical subject matter experts as well as the ability to add your own protocols and notes. Stress and fatigue make it a challenge for nurses to stay healthy. Wellbeing For Nurses Magazine aims to combat this with a useful app. You’ll have access to monthly doses of in-depth articles that focus on the fields of health, happiness, and well-being. Stay up to date on the latest research with the Intensive Care Medicine app. Google Play users appreciate the free app’s advanced search and article saving capabilities. This app comes from the Intensive Care Medicine journal that continually publishes review articles, original papers, and education articles written by leading members of the medical community. Brush up on your anatomy with Organs 3D, which has tens of thousands of positive reviews on Google Play. The nursing app features 3D models, video, audio lectures, quizzes and text to create a rich learning experience for users. Nursing is a notoriously stressful profession, and sometimes, what you need most is a lighthearted break from the anxiety. Look to Nursing Jokes on Android for some necessary humor to get you through long shifts. MediBabble is a professional-grade app that provides medical interpretation for healthcare workers and nurses. This app aims to improve safety and efficiency nurses can provide to non-English speaking patients. It aims to allow users to communicate faster, on the go, with those who do not speak English. This app allows users to search by description and lists a number of infectious diseases that could relate to it. It lists symptoms and conditions of diseases to allow for fast recognition and diagnostic support. The searchable component of this app helps users to quickly find vivid images and information so that fast response time is possible. It displays pictures for diagnostics and support for emergency situations. The SML app is a tool to support diagnostics for physicians and nurses. It pulls from 400 resources from various associations to make finding information easy. Searches by keyword are easy and highly effective. A total everything-you-need tool, this app makes it easy to find key information whenever it becomes immediately necessary and you’re on the go. Eponyms features hundreds of common and obscure medical eponyms for easy searching and verification. It allows users to quickly look up the meaning of a term, no matter how obscure or unique it is, to find out what it refers to. This makes finding information faster than trying to navigate complex medical conditions by limited names. Nursing Central app is available through the Amazon store and is compatible on some Android devices. Ratings are based on the current app version for either Google Play or iTunes stores. Ratings are current at the time of publishing. For clarity, ratings have rounded to the whole number. Please visit the app store to review the current ratings. Some apps may require you to purchase. Some additional costs may also incur after initial payment. Please refer to the app’s terms of service agreement before purchasing. Some apps may require you to sign up before using. Some free apps may have in-app advertising or purchases. Please refer to the app’s compatibility requirements as they may not work on all devices.